So, begins an article about the University of Washington professor Sharona Gordon leading a team of faculty and post-doc researchers in last year’s UW Ride the Rain challenge. Sharona, professor of Physiology and Biophysics, studies how the body becomes sensitized to pain. She and her husband Ira (also a UW professor) are dedicated bike commuters. 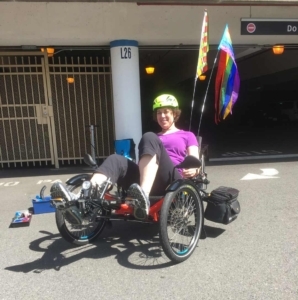 When surgery for a serious elbow injury ended her upright riding days, Sharona turned to RecumbentPDX for a solution. She, Ira and two of their children spent the day in Portland riding trikes with our boss Janet (it was pouring rain –not surprisingly, Sharona was ecstatic). Sharona’s new HP Velotechnik Scorpion FS26 with a Go SwissDrive pedal-assist motor provides exercise when she needs it and power when she wants to step-up the speed up Seattle’s hills. The no-weight steering mechanism ensures she will stay well within the lifetime restrictions.